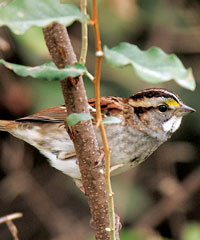 I was excited to see a White-throated Sparrow last week! It's the one bird I watch for to tell me when the weather is about to turn. They show up in mid-Michigan right after the last frost in the spring and right before the first snow in the fall. They can be spotted hanging around for a couple weeks before they continue to their wintering grounds in the eastern states below Michigan and in small numbers in southwestern states. The White-throated Sparrow is medium sized sparrow with brown streaked upper parts, plain gray underparts, and has a conspicuous white throat and yellow lores above the eyes between black-and-white or black-and-tan stripes on the head. White-throated like to scratch on the ground with a series of quick kicks when they feed and remind me of chickens. These birds follow a well-defined hierarchy, which puts males ahead of females and older sparrows ahead of younger sparrows. The oldest male birds are the ones that sing the most. They are known to migrate at night and begin their flights around sunset. Some research studies suggest they use star patterns as one means of navigation. 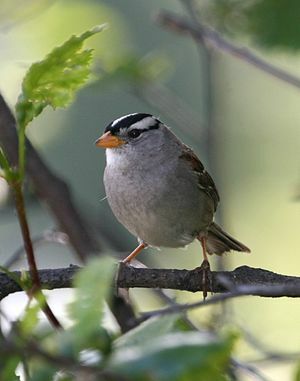 Be on the look-out for the White-crowned Sparrows too. They usually migrate around the same time as the White-throated. Their visits to feeders tend to be early and late in the day. Like most sparrows, they enjoy millet and also will eat sunflower seeds.